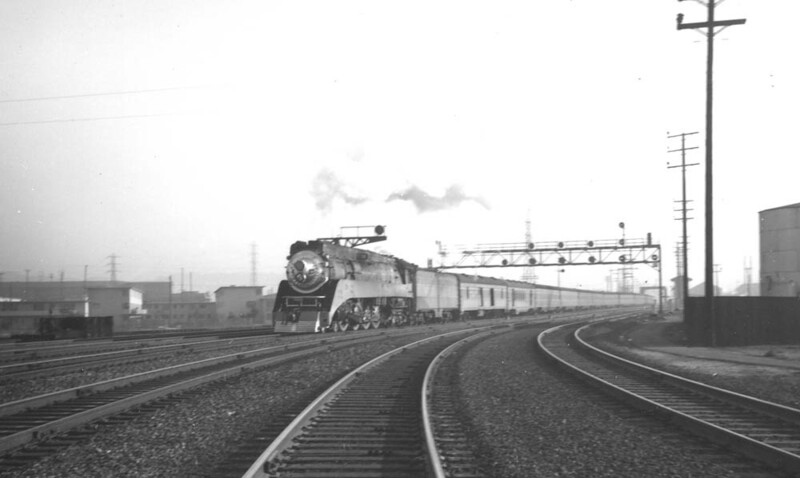 The Morning Daylight, train #99 leaving the LAUPT, 8:15AM, 1951. The Lark, train #76 inbound arrives at 8:30AM. 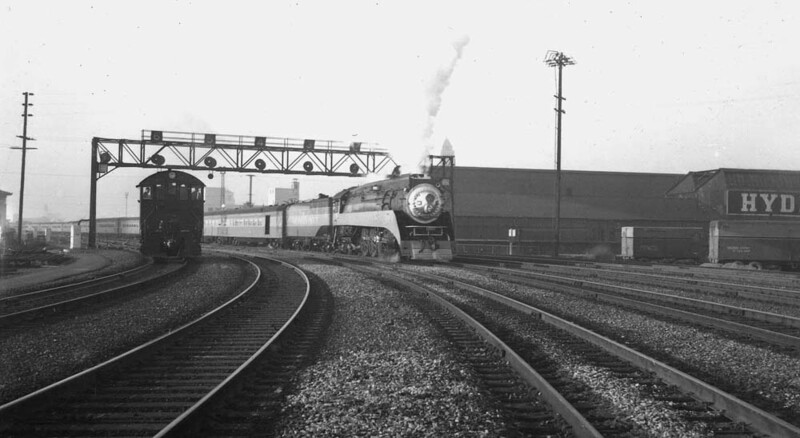 Santa Fe Engine 3731 heads the Second District Local out of Union Station Terminal. 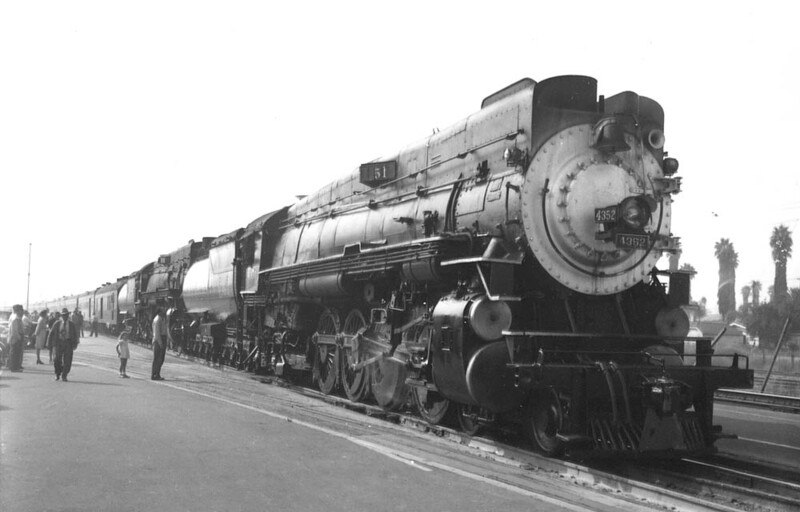 Santa Fe, Atlantic type engine #1486 with Train #145. 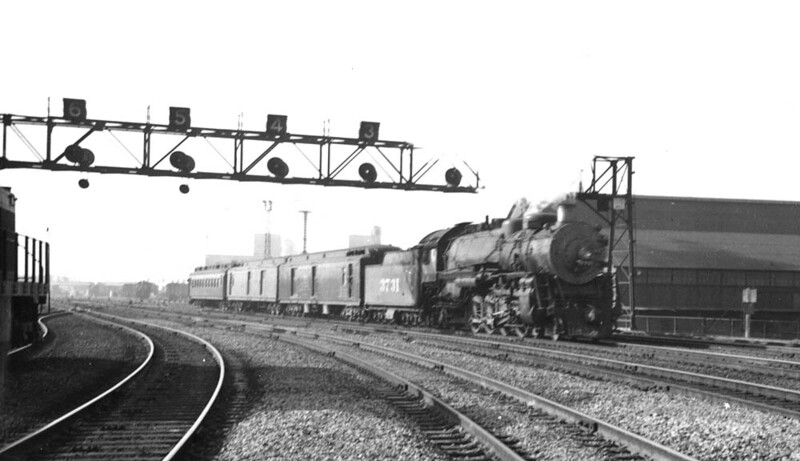 More information needed as I do not have a early 1950s timetable for Santa Fe. More photos of the LAUPT will be added when scanning a lot more of the 3 1/2 x 4 1/2 B&W; Negatives. Extra 4137 heads its freight train Westbound on the #1 track passing Taylor Yard. Engine 4263 and crew await their departure, no train number in the number boards. 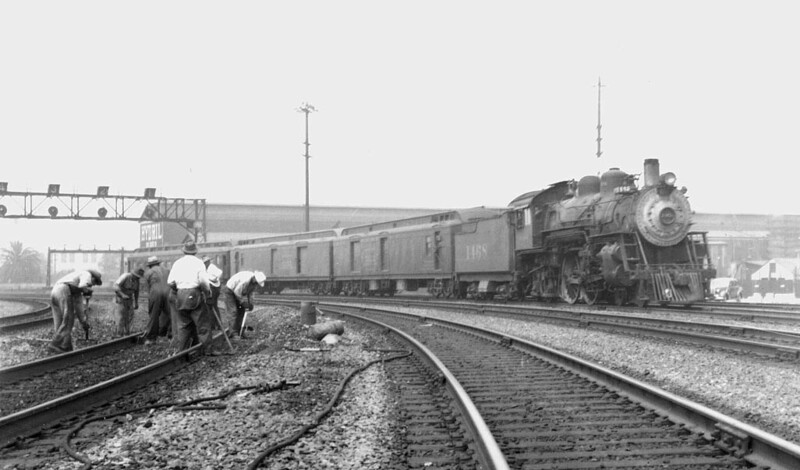 Seen at the far right is a Caboose storage track. 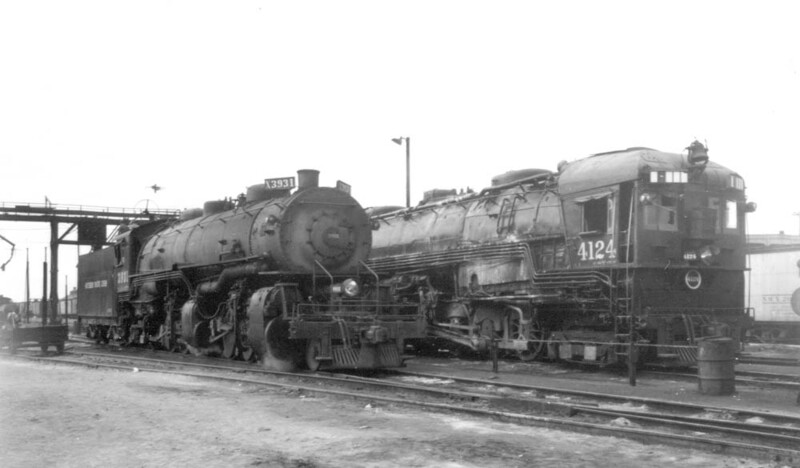 Engine 3931 (left), a MM-3 type built by the Schenctady in 1920, AC-5 (right), #4124 was built in 1929. Cab forwards line up on the service track. 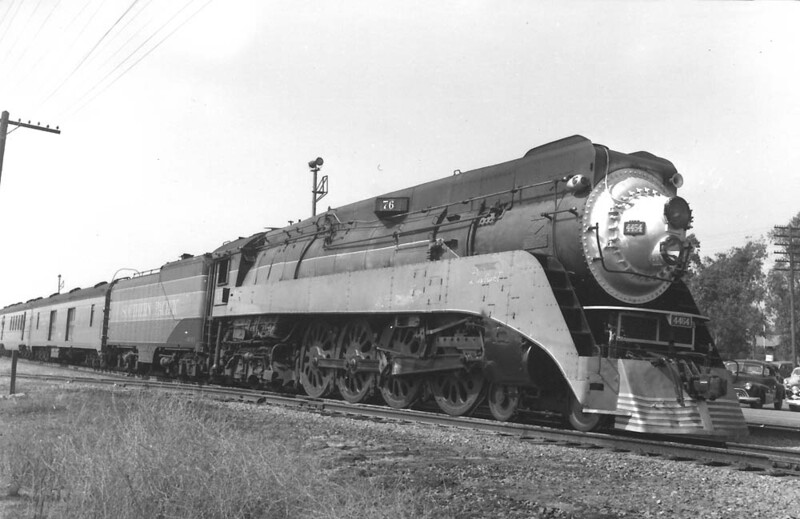 Note that the tender still carries the Southern Pacific Lines name. 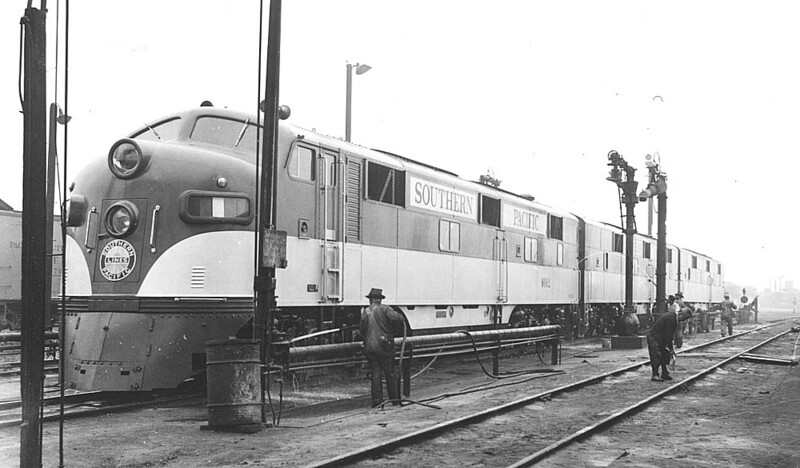 SP Locomotive #5004 and its crew prepare to take water and fuel oil. 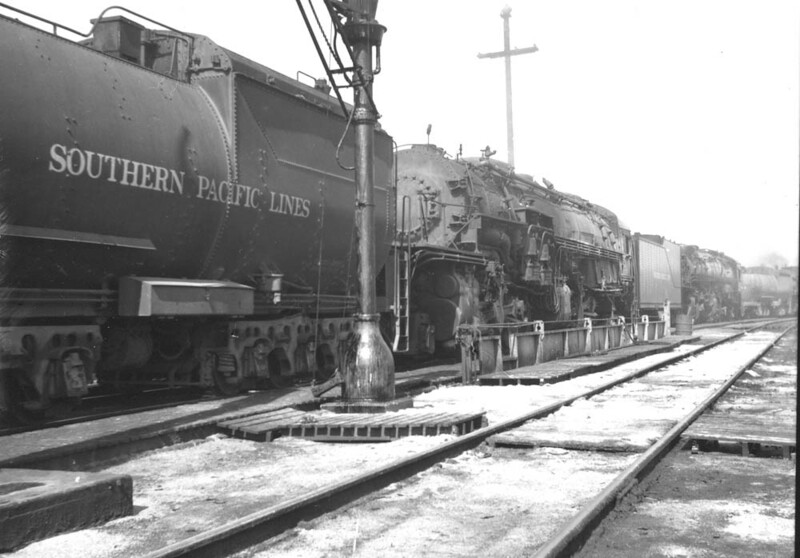 Note the sawdust burner in the background, part of the PFE lumber mill in their repair yard. 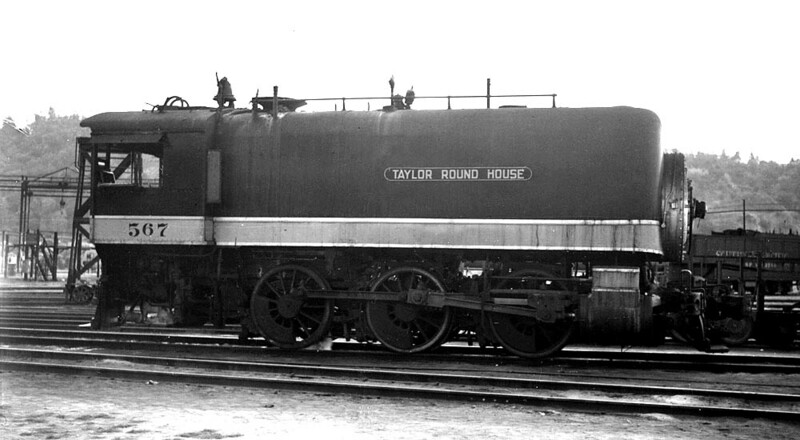 The Taylor Roundhouse switch engine #567 waits another switching order from the Roundhouse Foreman. 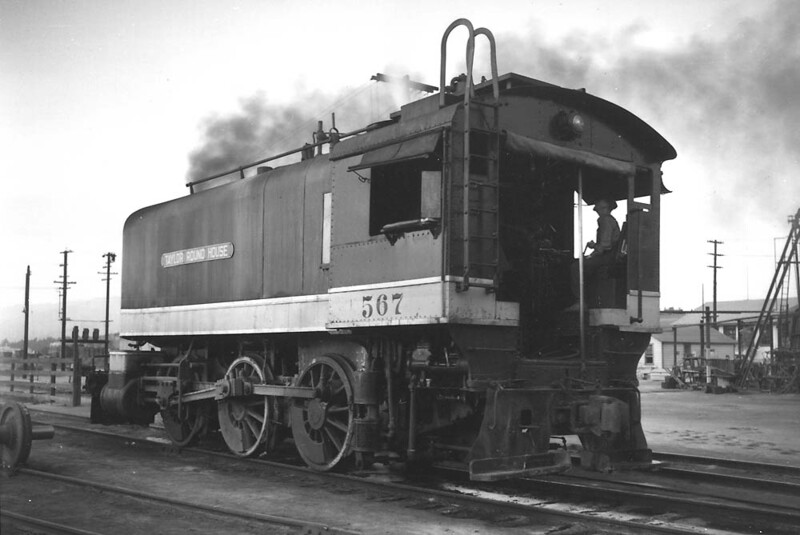 Another view of Roundhouse Switcher #567. 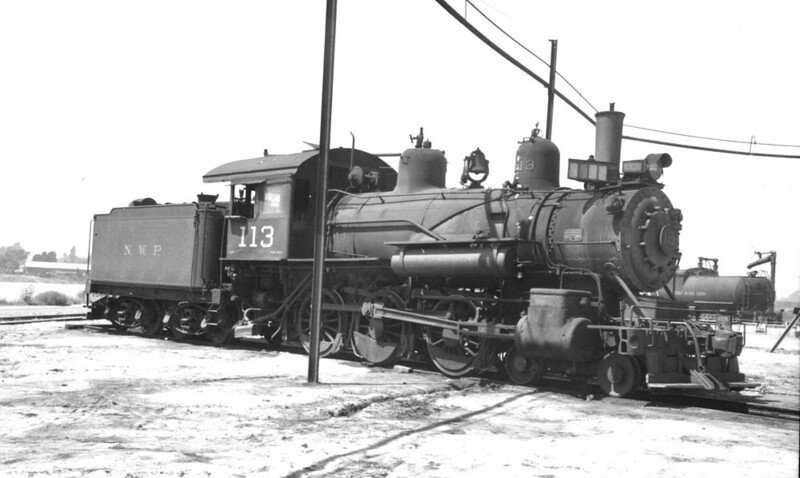 North Western Pacific engine #113 sits on a roundhouse track, it was out of service in 1947 and later scrapped. 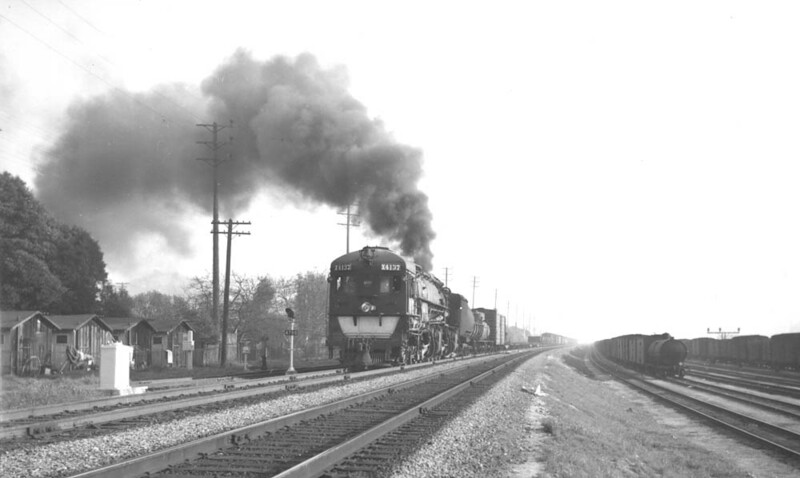 Brand new EMD, E-7’s, Golden State passenger train power shares fueling facilities with steam before diesel facilities are built. 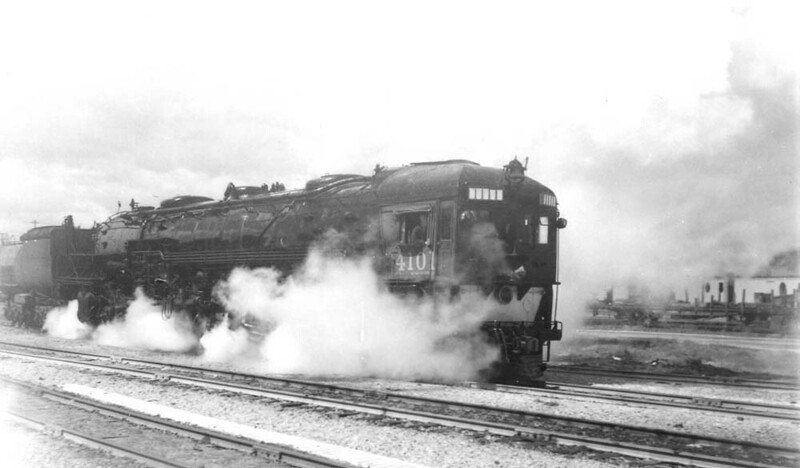 Cold day, and snowed too in 1951 as the 4101 moves around on SP Company property. 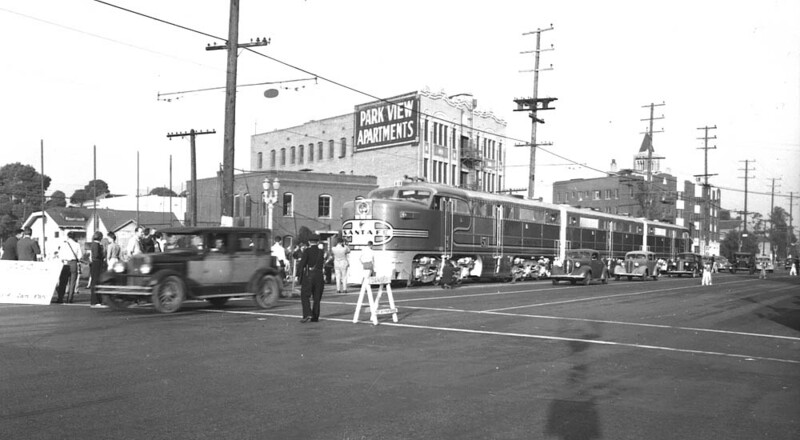 Santa Fe displays their new Passenger PA units during October 8-9, 1946 on Exposition Boulevard, Pacific Electric tracks. A contest held by the Santa Fe for the five best Pictues judged by the photo editors of local newspapers. 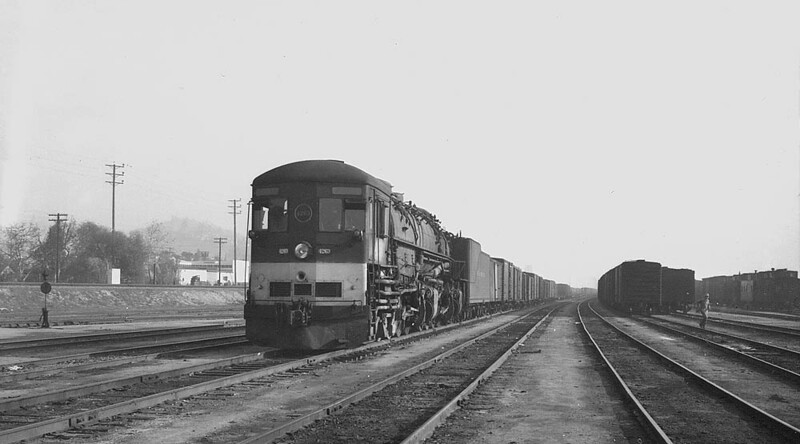 Southbound Lark, #76 at the Glendale Station. Its normal time is at 8:10AM, but it appears to be later in the day from the direction of the sun. Also notice the dent in the pilot. Two MT-4’s provide plenty of power for the San Joaquin Daylight.